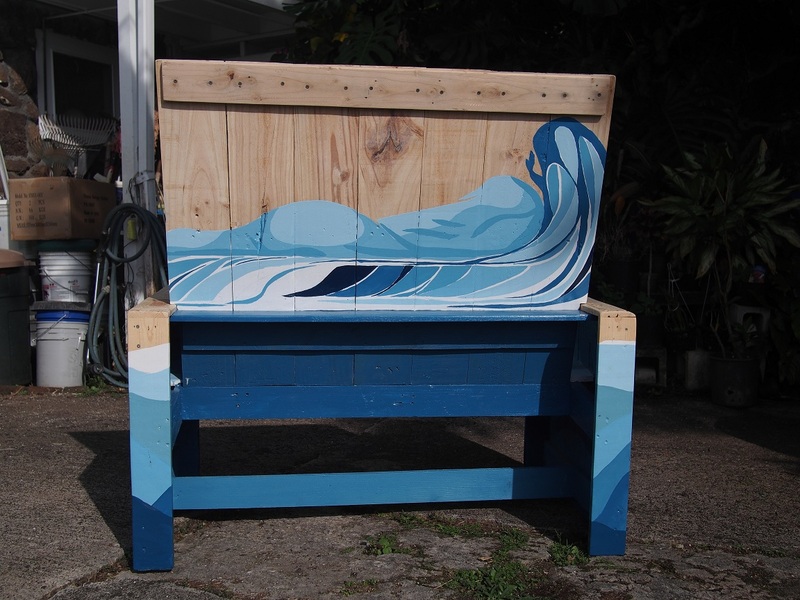 I've been spending a lot of time working on chairs, benches, and artwork in general. Having completed my MBA early last year, I felt as though my creative side was suppressed for 3 years. My right brain was screaming to make a comeback and it all started with #dakaikooschair. 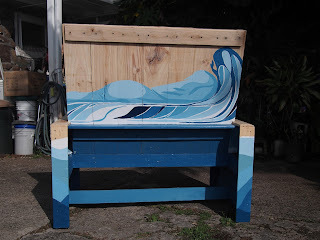 I began to research upcycling, woodworking, and pallet furniture. 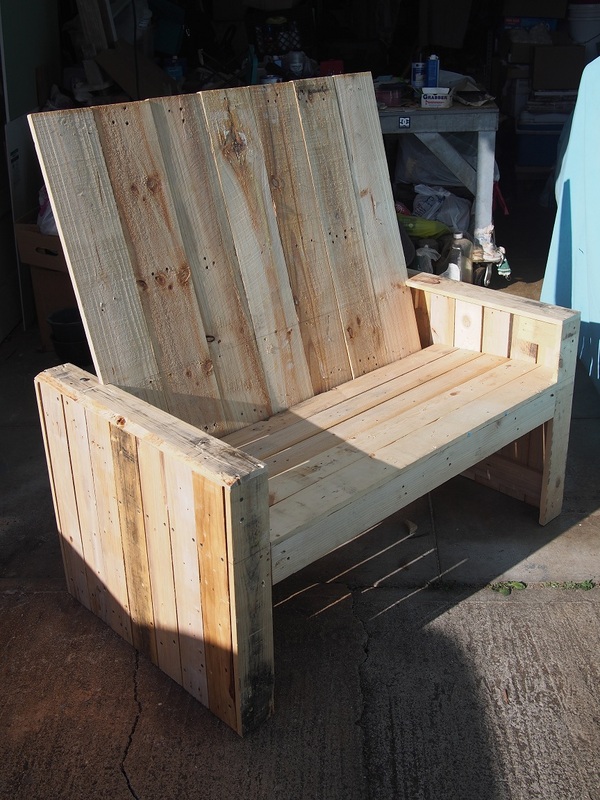 After discovering that the ideal chair had a seat that was somewhere around 18" tall, 18" deep, and canted at 5 degrees, and had a backrest that was canted at 5 ~ 15 degrees, I decided to collect a few pallets and make myself a bench. With the upcoming Pipeline contest, I thought what better way to continue the legacy of #dakaikooschair than to create another chair for Pipeline. What resulted was a bench made entirely of pallet wood. 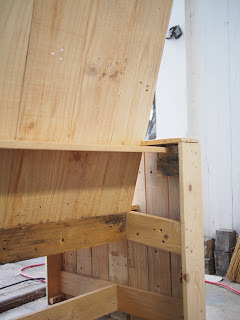 I did purchase screws, sandpaper, wallpaper glue, and some paint to put all the pieces together, but feel good knowing that a portion of it is made entirely from wood that would have otherwise ended up in the dump. I've been interested in continuous line (or single line) drawing for a while and wanted to incorporate that into the chair somehow but, knew that doing so with a paint brush and paint wouldn't work as "continuous" as I would like. I decided to paste a few pieces of newspaper together to create a canvas and used Posca pens to draw an image that exemplified "good vibes". 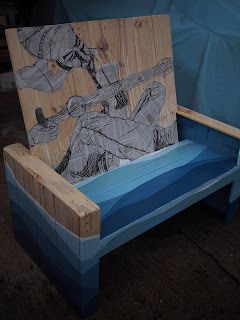 I cut out pieces that I felt could use the texture of the wood as an accent, such as the guitar, and used wallpaper paint to adhere my art to the bench. One evening, as I was tinkering with Microsoft Paint, I created an image of a woman lying down and thought it would be cool to have her hair represent the waves of Pipeline. This image, I transfered to the back of the bench, using house paint and Posca pens. I learned a ton from this bench. First, pallet wood is very thin and the longer the piece of wood, the more susceptible it is to bending and eventually breaking. 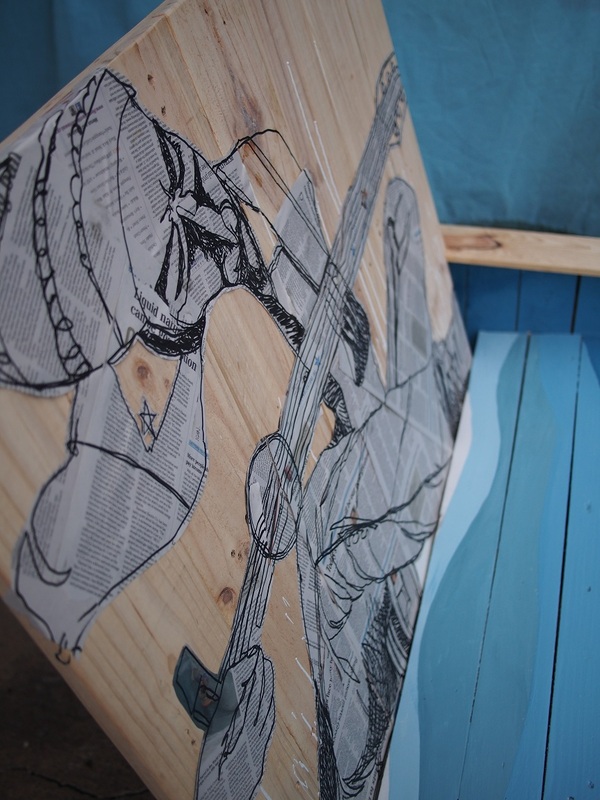 Posca pens, while convenient for drawing lines, run and smear when various clear coats are applied. 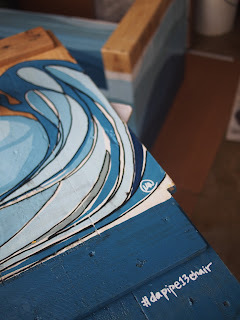 The best way to apply a clear coat over Posca pens (that I know of) is to mist spray clear over it, a few times. My friend Risa, who is an avid acrylic painter, reintroduced me to glitter. I remember applying glitter over Elmer's glue, back when I was but a munchkin. 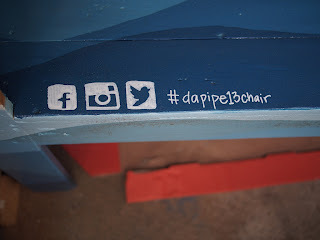 For #dapipe13chair, I used a finer grade of glitter and sprinkled/blew it onto the clear coat. Don't use too much! Light color glitter, like the gold I used, intensifies the glare and dark color glitter, dark blue that I used, makes the artwork and furniture look darker, from afar. 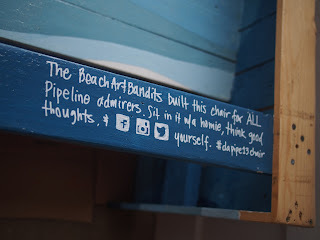 All in all, it was a great project and I thought it would be fun to see who appreciated it, after dropping it off at Pipeline. My friends thought I was crazy to leave it at some public place, unattended, but I had no intention of retrieving it. I thought it could be a cool social experiment, like the dollar bill or the bookcrossing.com book that travels the globe. 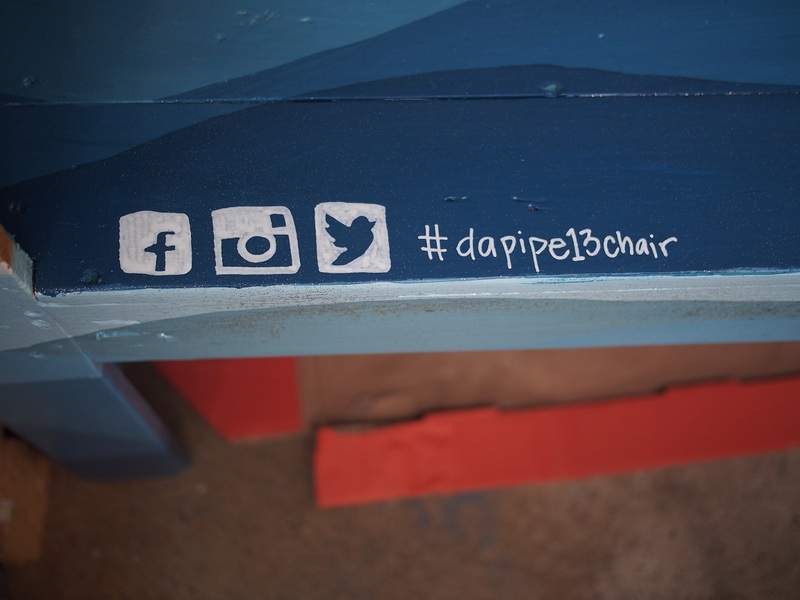 If you see it and have a moment to Facebook or Instagram it, tag yourself and #dapipe13chair! I like continuous line drawings.